Manchester City recovered their five point lead at the top of the league after putting West Brom to bed at the Hawthorns. Goals from Leroy Sané, Fernandinho and Raheem Sterling gifted City a crucial three points despite pull backs from Jay Rodriguez and Matt Phillips. Guardiola’s men weren’t quite at their grandiose best but City’s tremendous passing game, enabling a 78% possession swing in their favour, helped bring a halt to any West Brom resurgence in a hard fought 90 minutes. But what were the lessons from this riveting encounter? Here’s what we learned from the blues’ trip to the Midlands. It’s one of football’s oldest clichés, but for the past three games we haven’t witnessed City blow teams away. Instead, we’ve seen the Blues burying teams in a more subtle manner by keeping the ball, demoralising and draining the energy out of opposition. It’s Pep Guardiola’s peek signature — Bayern Munich and Barcelona were doing it for fun when the Spaniard was in charge of the respective sides and now Manchester City are implementing the art for all of English football to witness. Burnley, Napoli and now West Brom attempted to pluckily resist their scintillating brand of football — but all three sides failed in their tracks thanks to patience, persistence and composure being key ingredients in City’s game plan. 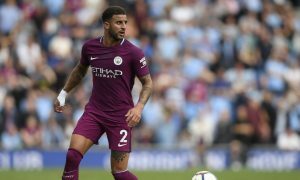 A myth has been circulating on Twitter for the better part of a few weeks, a rumour that states City’s £50million signing Kyle Walker can’t put in a decent cross. The saying has been pedalled even by pundits like Gary Lineker but the former Spurs favourite firmly put that misinformation to bed in the build up to City’s game sealing goal. A patient build up, moving the ball from side to side, eventually resulted in Walker receiving the ball down the right hand side — the Englishman, without hesitation, let loose a pin-point cross straight to the feet of Raheem Sterling who made no mistake. A crucial delivery for a crucial moment in the game. The myth has been put to bed. Goodnight. A 3–2 scoreline is perhaps a bit glossy from West Brom’s point of view considering they had very little say in the grand scheme of things, despite working hard. The Baggies’ two goals arguably resulted because City were their own worst enemies. The first, Ederson shouldn’t have came out to meet Jay Rodriguez. The Brazilian rushing out to meet West Brom’s danger man only allowed more space for Rodriguez to loft the ball into an empty net. The second, Nicolas Otamendi should’ve headed clear, but the Argentine’s attempt at being clever gifted Matt Phillips a glorious chance. Both these goals were avoidable, and City supporters won’t be panicking just yet at an overall terrific performance, but it shows no side is completely perfect.